MEXICO – Vancouver-based Goldplay Exploration has released the maiden resource estimate for its San Marcial silver project in Sinaloa. The resource contains 36 million oz. silver equivalent in the indicated category plus 11 million oz. silver equivalent in the inferred category. 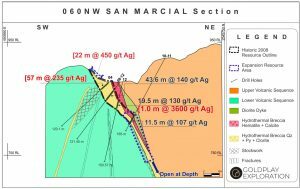 The bulk of mineralization so far outlined at San Marcial is suitable for open pit mining methods. More information is posted at www.GoldplayExploration.com.